Contains specially for young children from 1 to 4 years 10? g Vitamin D3. Vitamin D3 is required for the growth and development of bones and muscles. Vitamin D3 is for the growth and development of bones and muscles With 10 micrograms vitamin D, tuned on the advice of the Health Council of the Netherlands In line with the opinion of the Health Council of the Netherlands. Description Dietary supplement based on vitamins and minerals. 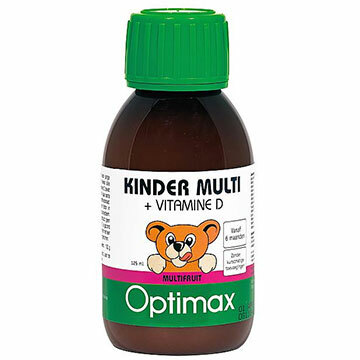 Optimax Children D Multi vitamins multi fruit. A healthy lifestyle is important. A dietary supplement is not a substitute for a varied diet. Liquid. Content and weight 125 Milliliters. Ingredients Ingredients: water, glucose/fructose syrup, Orange concentrate 13%, rapeseed oil, thickener (xanthan gum), emulsifier (polysorbate 80), Orange oil, dl-alpha-tocopheryl acetate, NIACINAMIDE, zinc chloride, preservative (potassium sorbate), acidity regulator (citric acid), calcium PANTOTHENATE, peach flavor, beta carotene (contains soy), retinyl palmitate, pyridoxine HCI, thiamine HCI, riboflavin, chromium picolinate, pteroylmonoglutamic acid, phytamenadion, sodium selenite, biotin, potassium iodide, ammoniumheptamolybdaat, cholecaciferol, cyanocobalamin.